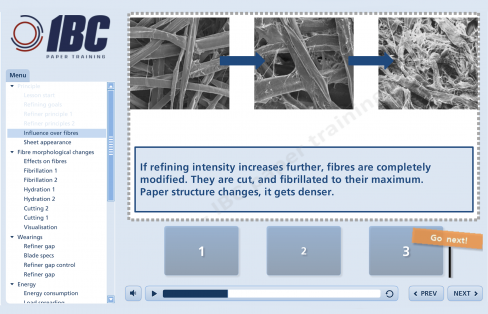 Module specially developped with neuro-scientific teaching technics i.e learning: – at your own pace, at your place of work – more often but on shorter period – by being active: interact continuously with the system to « do it yourself » – by following the playful explanations – by challenging yourself with quizzes and simulations. Dedicated to factory staff but also to suppliers or schools in relation with the pulp & paper industry. Available in french and english. Sustain the competences of your process... We develop specially for you and only for you, e-learning modules fully adapted to your process. You will find the theory completely integrated in your process, in synergy with your practice, that will boost the effectiveness of your training, and therefore, of your production.